Drop your freight and Brokerage costs dramatically! Are you a rod builder and need those specialty components that only Muddle can provide? Need to complete a single small repair and only need one or two small items? Are the freight duty and brokerage costs greater than the item you need? Why not piggy back and add your order to our bi-weekly order and split these costs accordingly! Contact us here after visiting the Mudhole website here. See here for our Rod Building Section. 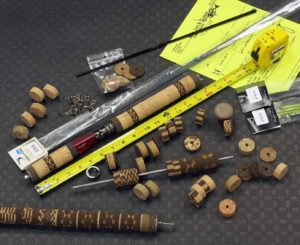 Mud Hole Rod Building & Tackle Crafting – Muddle Custom Tackle – Assorted Rod Building Components. Mud Hole Rod Building & Tackle Crafting is the largest supplier of custom rod building components in the world, including handles, grips, rod guides and reel seats from the industry’s top brand names. We also carry rod building components for all price ranges and skill levels, and have every fishing application covered including freshwater, saltwater, fly and ice fishing components. We are a company filled with outdoor enthusiasts. The only thing we love more than fishing and building custom fishing rods is educating others on how to do it themselves! Are you tired of using the same old off the shelf fishing gear that plagues retail centers? Because we have literally everything you need to build your own fishing rod and custom lures, and carry the largest selection in the world.